Climb aboard the ferry and listen to seagulls as you approach Birdwell Island. 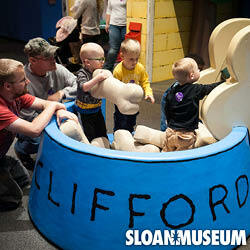 Encounter a colossal nine-foot tall Clifford and slide down his tail. 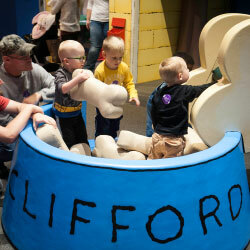 Children can work together to fill Clifford’s big dog bowl, and gain self-confidence on stage with Clifford and his pals. 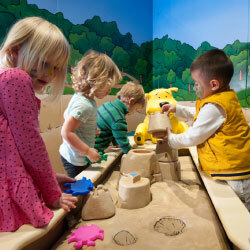 Explore T-Bone’s beach, find buried treasure, and build a sandcastle. Start a dance party and play instruments in the Musical Marina. 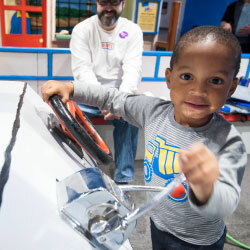 Crawl through the tunnel in Cleo’s Backyard and try shape-sorting and matching activities. Browse the Norman Bridwell Art Retrospective –and create some art of your own! See 51 years (that’s 357 dog-years!) 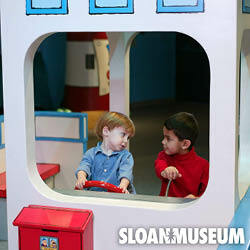 of artwork and stories by the creator and award-winning author of Clifford The Big Red Dog. 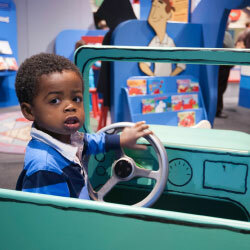 Paws-on adventures introduce “Clifford’s Big Ideas,” ten simple life lessons that support children’s growing understanding of how the actions they choose make a difference to themselves and others. Clifford’s Big Ideas include: Share, Play Fair, Have Respect, Work Together, Be Responsible, Be Truthful, Be Kind, Believe In Yourself, Be A Good Friend, and Help Others. 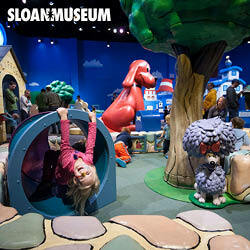 Adventures with Clifford The Big Red Dog was created by Minnesota Children’s Museum together with Scholastic Entertainment. ©2017 Scholastic Entertainment Inc. SCHOLASTIC and logos are trademarks of Scholastic Inc. CLIFFORD, CLIFFORD THE BIG RED DOG and logos are trademarks of Norman Bridwell. All rights reserved.